From Goodreads.com: Harriet Wheatley is the mastermind behind the Ladies of Virtue's quest to rehabilitate the gentlemen of the ton. 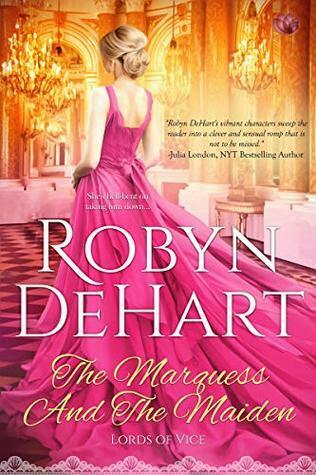 So when it comes to selecting her own target, she knows who to choose: Oliver Weeks, Marquess of Davenport—the most extravagant wastrel in all of London. While this story was for me - an OK read, I don't think the synopsis really personifies the story. Yes, elements of the synopsis do come into play - but its not what you think. In fact although Harriet does bring it up to "reform" him, nothing is ever really done. You see, Harriet and Oliver were supposed to be married six years prior (an arrangement between their mothers), yet he made it perfectly clear that he did not want her, nor would he ever. So years later, Harriet is trying to find him an acceptable wife, while he is trying to prove to her that he wants her as his wife. The romance between them was ok - it was obvious they desired each other, but I think Harriet's firm belief that he was merely trying to torment her went on so often it became boring. When they were fighting they were interesting. When he was trying to court her, they were boring. The real kicker for me is the fact that an entire sub-plot revolving around Lady X and the Women of Virtue was left utterly unresolved. I'm sure that was done in order to set up the next book in this series, but I am sure the cliff-hanger ending of this particular plot will upset some readers. Overall, I think people who enjoy historical romances will still enjoy it and I would read more from this author.